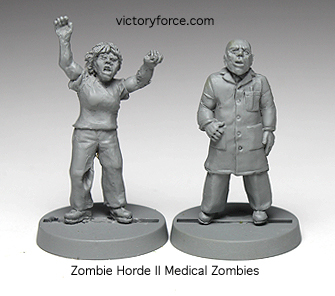 In the Zombie Horde II: First Responders, you will find zombie medical personnel, as well as other first responder type figures. Many of these figures are dressed in hospital scrubs. Use them as the staff that did not survive the outbreak in your zombie hospital or outbreak scenarios. Find them in Zombie Horde II (100 figures) in the Creatures Section of the Victory Store. Part of over 1000 figures available in the Victory Store. This entry was posted in Spotlight and tagged figures, spotlight, zombies. Bookmark the permalink.